Express the power of your faith and your love with this exquisite Thomas Kinkade personalized ring jewelry. 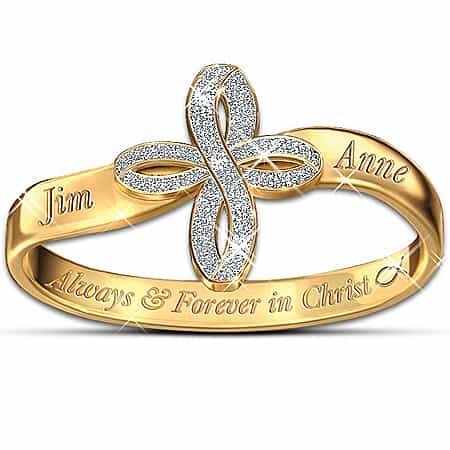 Finely crafted in 24K gold-plated sterling silver, this elegant religious couples personalized ring features the dramatic infinity cross design, elegantly accented with Swarovski® crystals in a pave setting. Best of all, this gorgeous religious cross jewelry is engraved with the names of you and your loved one. Inside, the inscription “Always & Forever in Christ,” is flanked by the timeless symbol of Jesus, the Icthus fish.